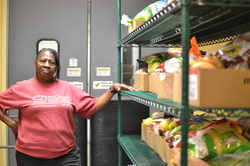 Since 1983, Manna Food Center’s mission has been to eliminate hunger in Montgomery County through food distribution, education, and advocacy. With assistance from the Wolpoff Family Foundation, Manna has been able to grow the Karen Goldberg Smart Sacks program substantially from 27 schools to 60 schools, providing essential food to 3,255 children each week. The partnership between the Wolpoff Family Foundation and Manna ensures that children experiencing hunger and food insecurity will return to school on Monday mornings properly nourished and ready to learn. By feeding children, and providing nutrition resources, the Wolpoff Family Foundation and Manna are growing a generation of children who will better understand the need for good food in order to learn and succeed.